Christmas is a magical time full of indulgence, laughter and that warm fuzzy feeling. I love Christmas! But in the mix of all that fun, it’s important we spare a thought for our pooches. A lot of change happens in our homes around Christmas time that can present a danger to our dogs. Decorations, guests and toxic foods are just some of the potential problems our dogs may face at Christmas. None of us want our pups to have an accident at home, and especially not during one of the happiest times of year. Which is why it’s a good idea to consider these common Christmas dangers to prevent any mishaps from happening to your pooch. So to keep your dog safe and happy this Christmas, here are 10 useful dog safety tips. It wouldn’t be Christmas without a tree, and real or fake, both pose a risk to our pooches. Most dogs are unsurprisingly attracted to tinsel. It sparkles, makes a ruffling noise and has an unusual texture in the mouth. It’s tempting for any curious pup, but unfortunately can cause an intestinal obstruction if ingested. String lights make a tree complete, but dogs can become tangled or electrocuted if tree lights are chewed on. And if delicate glass baubles are knocked and broken on the floor, sharp edges could cut your dog’s paws. If your heart is set on a real tree this year, there are a couple of things to consider. The stagnant water in the base can become filled with harmful bacteria which can make your dog sick if drank. Pine needles can also make your dog feel unwell if eaten, and they can also get stuck in their paws and throat. To keep your tree entirely dog safe, either put a barrier in front of the tree or raise it up to prevent access. If that’s not possible, you could keep all tinsel, lights and baubles away from the lower part of the tree and vacuum pine needles regularly. Ensure your tree is properly supported with a secure base so it can’t be pulled over easily, and cover the base so your dog can’t drink the water. As much as we want our dogs involved in the Christmas celebrations, we certainly don’t want an over-excited pooch that becomes a real nuisance. Hustle and bustle from guests coming and going can overstimulate your dog which could lead to jumping up, barking, and over-friendliness. So to keep things calm, take your dog for a run or long walk before guests arrive. By burning off excess energy, your dog will be more likely to relax in their bed than get under your feet or try to steal food from the table! 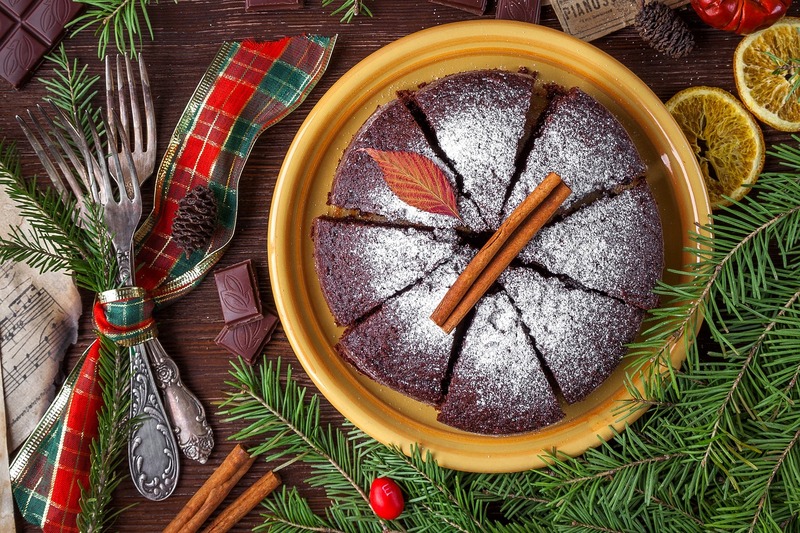 Christmas brings almighty spreads of delicious comfort foods we love to eat. But it’s important to note that many of our festive favourites are in fact poisonous to dogs. Chocolate, alcohol, onions, grapes, garlic, raisins and macadamia nuts are just some of the popular Christmas foods that are toxic to dogs. Here is a more comprehensive list of foods you should never feed your dog. Ensure you don’t leave food lying around or abandoned for prime pickings on a low coffee table. Keep all Christmas treats behind closed doors or up high where your dog can’t reach them. And if you suspect your dog has eaten something they shouldn’t, call your vet immediately for advice. During the festive season many of us like to fill our homes with Christmas plants for a splash of colour. But bear in mind some popular choices like Holly, Mistletoe, Amaryllis, Cyclamen and Hellebores are just a few of the plants that are poisonous to dogs if eaten. Here is a more comprehensive list of plants that are toxic to dogs all year around. Symptoms from plant poisoning range from vomiting and diarrhoea, to the more severe breathing difficulties and even death. In most cases your dog will need to ingest a lot of the plant to suffer a severe reaction. But it’s never worth the risk. Always keep toxic plants on a high shelf, windowsill or leave them out of your home altogether. If you think your dog has eaten a poisonous plant, seek veterinary help immediately. 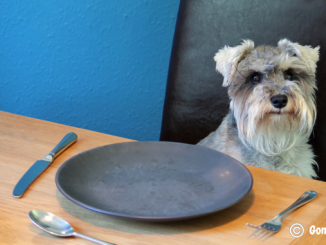 Christmas is a time for sharing, but sharing leftovers is not always the best idea when it comes to Fido. Even human foods that are technically safe for dogs can cause an upset tummy. Dogs can have particularly sensitive stomachs when consuming lots of new foods. You may think a sneaky piece of turkey won’t hurt, but if all your guests think the same way, that small slither can turn into a lot. 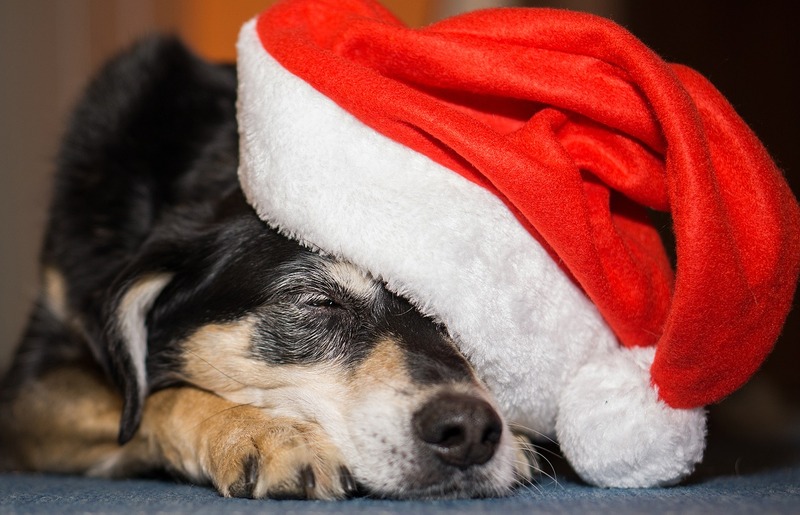 Your dog could spend the rest of Christmas with abdominal pain, diarrhoea or vomiting, and could even contract pancreatitis from excessive fatty foods. Never feed cooked turkey bones as these can splinter and become lodged in the throat or intestine. 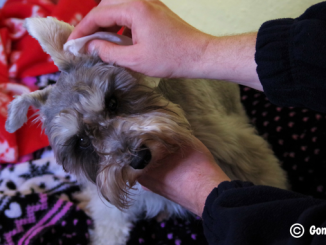 Avoid giving turkey skin – dogs find this difficult to digest and they could become unwell. Even the turkey meat which is considered safe in moderation could upset your dog’s stomach because it is a rather rich meat. But if you can’t resist sharing the love with your pooch this Christmas, offer a small amount of white, skinless turkey meat and see how they go. Just be sure to tell your guests not to feed their leftovers so your dog doesn’t overdo it. If you’re having guests over for Christmas, your dog will need a quiet place to retreat if it all gets too much. With the constant mumble of guests, party poppers, children running riot and champagne corks popping, your dog could quickly become overwhelmed, particularly if your pooch is already slightly anxious. Ensure your dog has a comfortable bed to relax in a quiet room that’s off limits to guests. If your dog is a little nervous of people and noise, you could try a calming diffuser. There are also calming tablets and treats you can buy, but they do have mixed reviews. What may work for someone else’s dog may not work for yours. 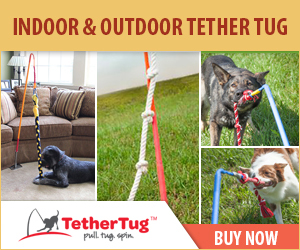 It takes a little trial and error to find the best solution for your pup. Another option is to use a thunder shirt which has offered some impressive calming effects for some dogs. Christmas is a time for exchanging gifts. But that often means presents, toys and wrapping paper are left strewn all over the floor. With small parts and batteries lying around this can be particularly hazardous for an inquisitive pup. If eaten it could cause an intestinal obstruction. And if batteries are punctured from chewing, this can lead to severe chemical burns in your dog’s mouth and intestines. Wrapping paper, ribbon and plastic packaging can also be a choking hazard. Have a binbag handy before you begin exchanging gifts so you can clear up as you go along. 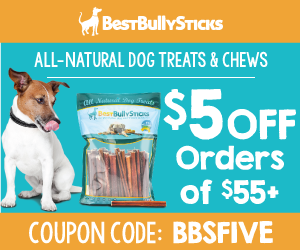 New gifts can be tempting for your dog to explore with their mouth – you don’t want to be left with a chewed-up mess before you’ve had a chance to use it. Keep presents out of reach or locked away in a room until you can find a home for them. If you’re looking to spoil Fido with their own gifts this year, check out these 15 imaginative Christmas gift ideas for your dog. Just make sure you bin all the wrapping before your dog can get to it! 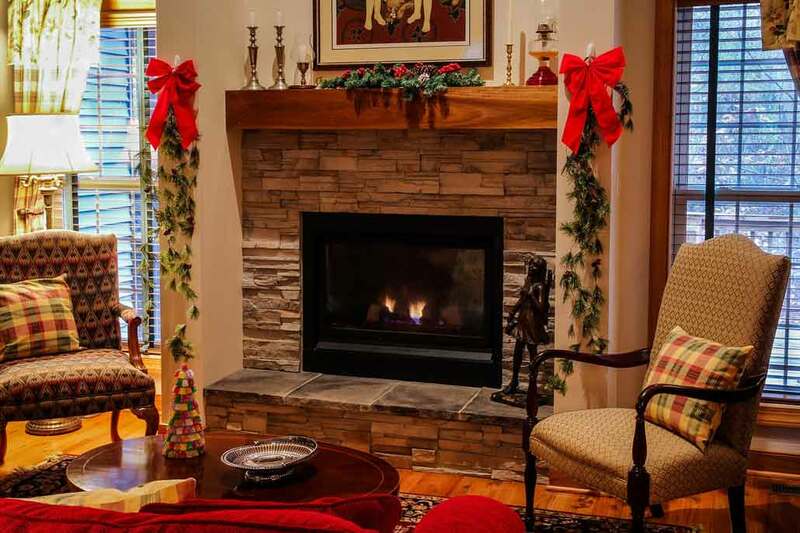 Christmas is the ideal time to snuggle up next to the fire with scented candles glowing. 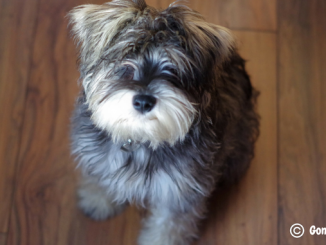 But wagging tails can easily knock candles over if left at dog height. They could also burn themselves if they’re keen to explore. To keep your dog and your home out of harms way, keep candles on a high shelf or a mantel piece. With children running around and the excitement reaching boiling point, use a fireguard to protect children and your dog from accidentally running or bouncing into the fire during play. Don’t assume your guests will be as conscious of your dog’s needs as you are. They’re probably not in the habit of taking the usual precautions you’re used to doing for your dog. Inform guests when they arrive to hang up their coats and bags out of reach. 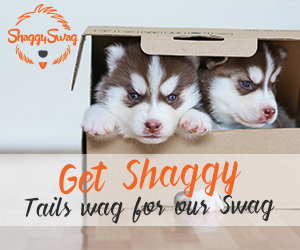 They could be carrying medications, makeup and other titbits that could cause a blockage or poison your dog if eaten. You could choose a specific room to hold all your guest’s belongings and simply keep the door closed. Ask guests to keep doors to the outside closed. Guests popping to the car or out for a cigarette could leave the door open without realising, allowing your dog to wander off. It’s always a good idea to leave your dog’s collar on with their ID tag when having guests around, just in case they do sneak out unnoticed. Although Christmas is a happy time for us humans, the change in routine can be stressful and disorientating for some dogs. There’s only so much you can do to keep things normal at Christmas with so many guests and potential travelling happening. But try to keep the basics the same. 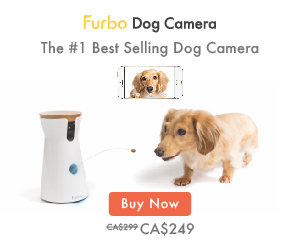 Feed and walk your dog at the same time you normally do. 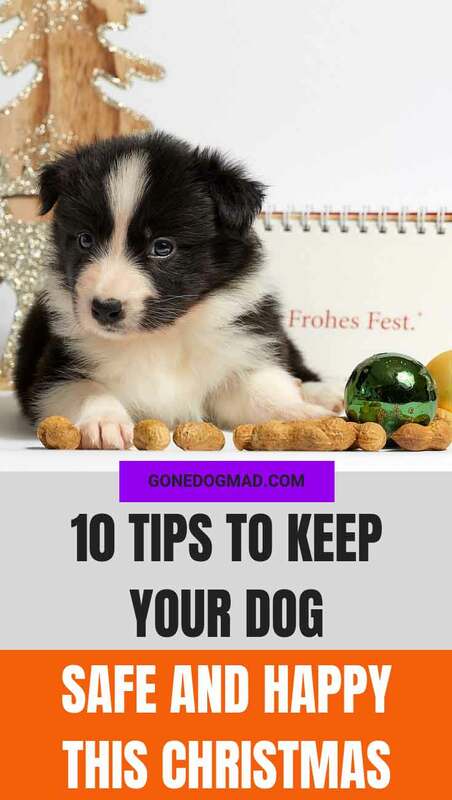 If you give them a chew at a particular time or have a play session at the same time every day, try to stick with it. Even if they’re a little shorter than normal. Dogs feel more stable and comfortable with a routine they can rely on. 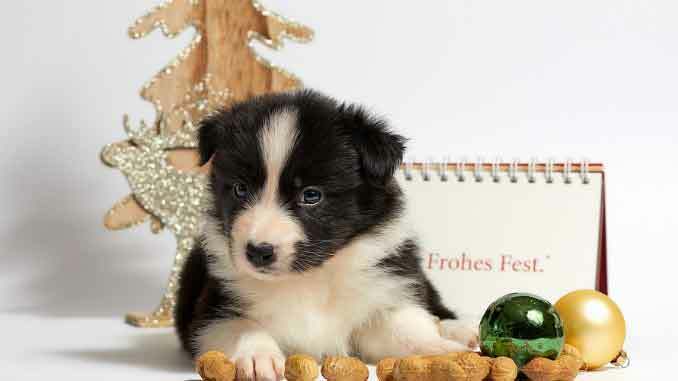 Running on their usual schedule as closely as possible, even with the added chaos, will go a long way to keeping your dog’s stress levels down this Christmas.